So many modern pixel games have vague influences, or have 8-bit styles. 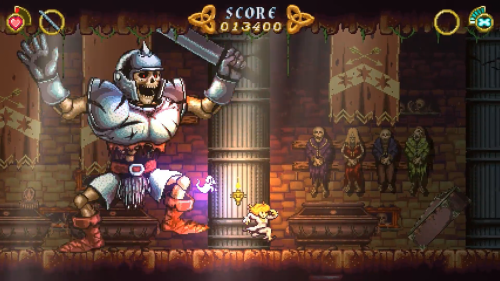 With Battle Princess Madelyn, the developers clearly were going for a 16-bit vibe, with an art and gameplay style that is largely based on the Capcom classic Ghosts and Goblins formula. After a crowd funding campaign and a long development window, the game is finally here on PC and consoles. Let’s see how it stands up! Battle Princess Madelyn is a colorful and well animated pixel art game that comes alive on the screen. The main character is well detailed and animates in a myriad of ways, and has real personality that comes through just through gameplay. The levels are varied and run the gamet of video game places like fire, ice, cave levels plus some more unique areas as well. The game features a robust soundtrack with great tunes that fit the graphical style. The sound effects sound great as well. The game is a series of side scrolling levels, with the player shooting projectiles and using melee weapons to take out swarms of enemies. There are also platforming segments that present quite a challenge, especially in later levels. Working in handheld mode, the game controls really well, with instant reactions to button presses even in intense areas. In addition, the game works fantastic with the Switch Pro Controller, which became my preferred way of playing it. There are two modes to the game, arcade mode and story mode. Arcade mode is more of a straight ahead action game with levels in order. The story mode adds a heart warming story, based on real life, of Madelyn with anime-style cartoon cut scenes and some voice acting. The presentation adds a lot to the overall feeling of polish and production values. A charming and challenging entry into the Switch platforming library, Battle Princess Madelyn harkens back to Ghosts and Goblins and delivers a solid experience for gamers.